Total Cash Flow and Value We now have all the cash flow pieces, and we put them together in Table 10.14. In addition to the total project cash flows, we have calculated the cumulative cash flows and the discounted cash flows. At this point, it's essentially plug-and-chug to calculate the net present value, internal rate of return, and payback. If we sum the discounted flows and the initial investment, the net present value (at 15 percent) works out to be $65,488. This is positive, so, based on these preliminary projections, the power mulcher project is acceptable. The internal, or DCF, rate of return is greater than 15 percent because the NPV is positive. It works out to be 17.24 percent, again indicating that the project is acceptable. Looking at the cumulative cash flows, we can see that the project has almost paid back after four years because the table shows that the cumulative cash flow is almost zero at that time. As indicated, the fractional year works out to be $17,322/214,040 = .08, so the payback is 4.08 years. We can't say whether or not this is good because we don't have a benchmark for MMCC. This is the usual problem with payback periods. Conclusion This completes our preliminary DCF analysis. Where do we go from here? If we have a great deal of confidence in our projections, then there is no further analysis to be done. MMCC should begin production and marketing immediately. It is unlikely that this will be the case. 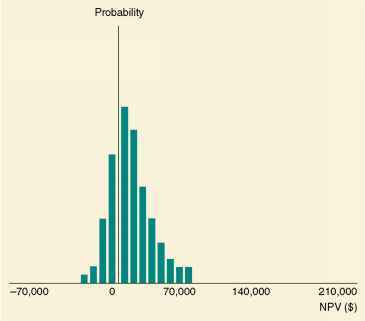 It is important to remember that the result of our analysis is an estimate of NPV, and we will usually have less than complete confidence in our projections. This means we have more work to do. In particular, we will almost surely want to spend some time evaluating the quality of our estimates. We will take up this subject in the next chapter. For now, we take a look at some alternative definitions of operating cash flow, and we illustrate some different cases that arise in capital budgeting.